Way back, when the indie makers in and around the metro Detroit area first began to rise up, it was exciting to be greeted by an eager and curious audience. Folks that were truly mystified by the talent and creativity on display and for sale. Today that audience has grown. More and more people have discovered “crafters.” They have their favorites and hunt for new keepsakes. And some of those treasure-hunters are engaged. Or in a wedding, or plan to be. They scour Etsy, Pinterest and the like for colors and themes and locals and price points. Who does custom work? Can someone make me this or that? It can be a dizzying and time-consuming challenge. When Angela Ficorelli of Moving Beauty reflects on her own wedding planning, she’s struck by how difficult it was to find custom and local makers specific to her needs. The idea was soon born to create a point of reference for those indie, arty, budget savvy and uniquely DIY gals (and guys) who are looking local. 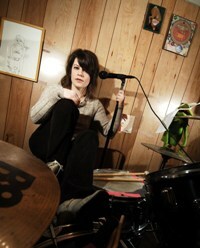 She daydreamed and sketched out the basics for such a group, naming it Indie Detroit Wedding Ring. Its formal debut a few months back was the online component where vendors, or wedding-makers, can fill out an application to be reviewed and accepted into the IDWR database. From there people can have a one-stop shop opportunity to find a DJ, photographer, artist, stylist, etc., who may fulfill that “made in Michigan” goal, or help you hit your budget with room to spare. 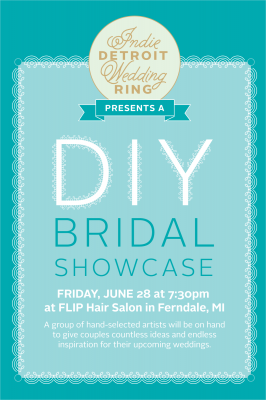 This Friday, June 28, bring a friend, sister, curious guy or mom to Flip Salon on West Nine Mile in Downtown Ferndale for IDWR’s DIY Bridal Showcase. This soft opening event starts at 7:30 p.m. and runs until 9:30 p.m. There will be some cool giveaways (a handmade tote for the first 25 guests! ), snack/drinkables and meet local crafters that make for weddings and special events. RSVP, and invite other friends, to the event over on Facebook.